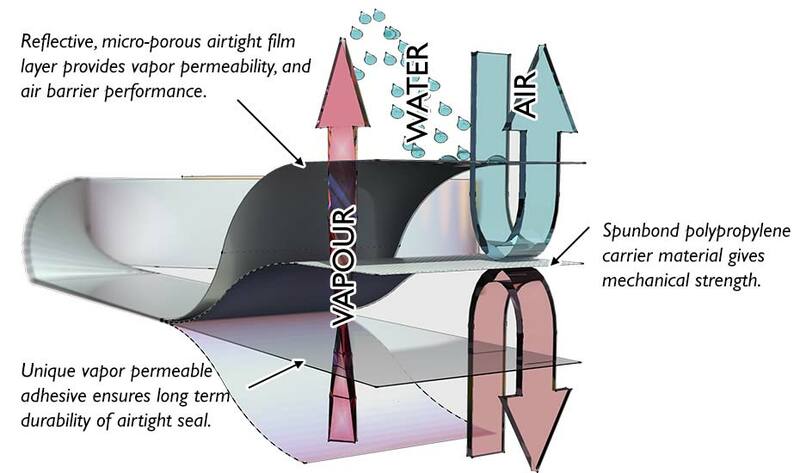 Reflectite® tape comprises a durable and flexible spunbond polypropylene carrier layer laminated to a unique vapour permeable adhesive. This ground breaking adhesive technology ensures a long lasting bond with common construction substrates. Reflectite tape provides an effective airtight seal at joints and penetrations without compromising the movement of moisture. This, combined with it’s metallised, low emissivity surface, makes Reflectite tape the ideal solution for jointing and sealing foil faced insulation boards without compromising performance. 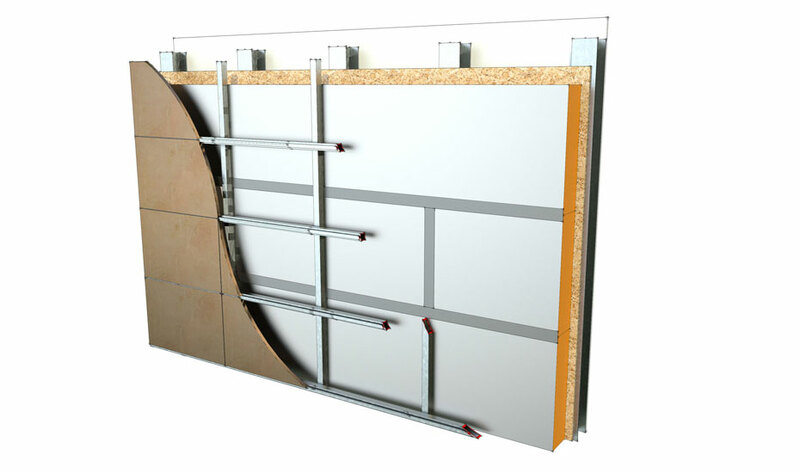 By enabling the use of foil faced rigid insulation boards as an external air barrier layer, Reflectite tape helps to reduce heat loss associated with air leakage and boost the energy performance of the building envelope. In contrast to traditional impermeable foil tape, it does this without leading to potential trapped moisture and interstitial condensation issues. 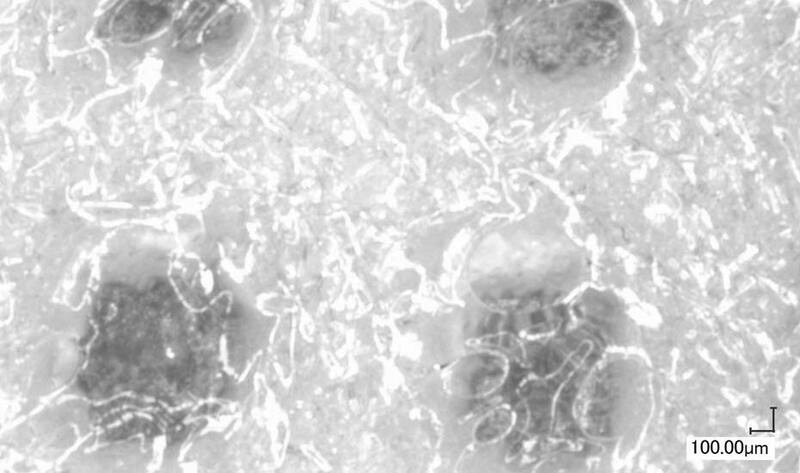 As seen magnified in the image above, the unique vapor permeable adhesive used in the Reflectite range is the result of many years of research and development in condensation control membranes. Derived from the adhesive coating used in the high performance Wraptite-SA external air barrier membrane, this durable and highly flexible cross linked polyfunctional isocyanate coating delivers both superb tack and improved peel resistance across all common construction materials allowing direct application to all substrates with minimal preparation. This ensures a faster and more robust installation process, with less potential for failure. In addition to the excellent mechanical properties of the adhesive, hydrophobic additives and the uniquely vapour permeable structure enhance the moisture resistance. This boosts not only initial tack performance, but also the long term durability of the bond, particularly in damp or humid environments. This in turn reduces the risk of tape joint failure and ensures as designed performance is maintained over the long term.